Joomla Virtuemart Booking and Reservation System : Here is Virtuemart booking and reservation system. This product provides the facility of single booking multiple days and multiple bookings single day. This product provides an online business platform for local business entities to manage their daily business in a systematic flow. In addition to this, the reservation system offers a range of features to easily organize and manage bookable items. Joomla Virtuemart Booking and Reservation System: Here is Virtuemart booking and reservation system. This product provides the facility of single booking multiple days and multiple bookings single day. This product provides an online business platform for local business entities to manage their daily business in a systematic flow. In addition to this, the reservation system offers a range of features to easily organize and manage bookable items. Has a feature to count first day (Yes or No) in 'Single order multiple day' categorized product like Hotels, Resorts and Marriage Halls etc. Has a feature to allow/disallow previous booking end date to be available for next booking. Includes zero shipment plugin(that works on the reference of product's custom fields) to allow zero shipments in case of Booking services. Application of 'Sweet alert' for better user experience. Added functionality of 'seat' selection by a buyer, depending on the quantity of the product in 'Multiple Booking Single Day' products. Provided functionality to limit booking corresponding to a buyer in 'Multiple Booking Single Day' products. 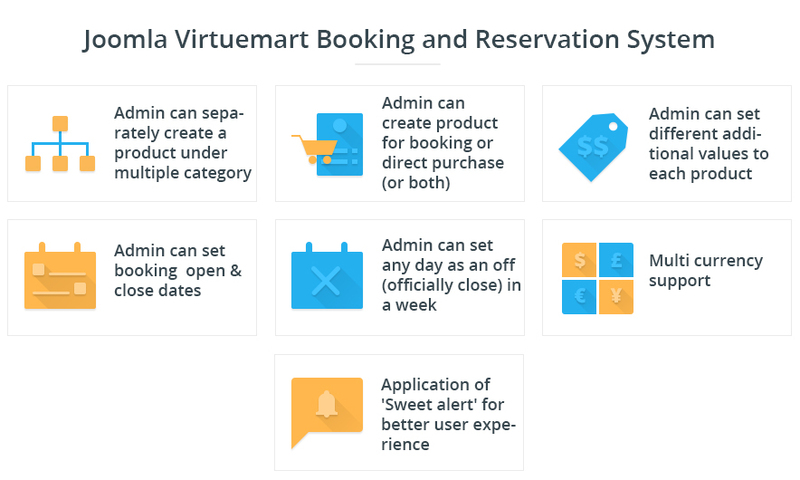 Did you buy Joomla Virtuemart Booking and Reservation System? 1) Functionality - This plug in works perfectly fine.Customer support is always there.Never any problems. 3) Support - I find that support is always quick and . What types of bookings supported by this extension? Joomla VirtueMart Booking and reservation system allows 'Single booking multiple days' as in case of hotel bookings, space bookings, etc. It also allows 'Multiple booking single day' as in doctor appointments, table reservation, etc. The product is still available to be purchased even after booked for a particular date/time, Why? To allow bookings as per available stocks only, you need to change VirtueMart default settings of product availability to "Displays 'Notify Me' instead of 'Add To Cart' button". We recommend the following documentation came along with extension once, as it covers everything. I am unable to 'Add new rental period and price' in 'single booking multiple day' product creations, Why? The reason for it is - JS of a custom field is available onto a product only after a custom field gets applied to it. So you need to save it first, then you'll able to set day durations. I want the product not to be available on a particular weekday, and its price should be different from a general day cost on to weekends, How can do so? The extension allows you to set up any day of the week to set as closed so that buyer will not be able to select that day on creating a booking. The extension also allows any day of the week to be set with a higher value of booking rate. In 'single booking multiple days' booking, some of my product goes to a booking from 1200 HRS of a day to 1200HRS of another day, so the last day is still available for next booking. Does this extension able to do so. Definitely. With this extension, you'll get an option to create a product where the last booked date is available for the next booking or not. So you can set any type of product, whether it counts a single booking on a single calendar date or it counts a single booking going from one calendar date to the next calendar date. What happens to bookings for which orders are in 'Pending' status? The extension provides options to admin whether he/she wants to block days of a booking on pending as well as confirmed orders. It also provides an option to set a number of hours for which system would check and freeze bookings, if a booking is in pending status.